People describe pain in different ways and people rate pain on different scales; even giving someone the traditional 1-10 scale is unfair. One person may rate a broken rib as a 7 where for someone else it is a 10, one person’s level 6 pain may be tolerable enough for them to still go to work where someone else could still push through pain up to a 9 before they consider it worth going to the ER for. Nerve pain is like this- what one person calls debilitating for them may be tolerable for someone else because so much depends on the person involved and their own level of pain tolerance. Nerve pain is difficult to live with but in most individuals, it can be reduced and managed to make living with it easier and less of an interrupter to daily life. Nerve pain is most commonly the result of damaged nerves that send out signals of pain at the wrong times and lead to chronic sensations of pain, numbness, tingling, and other uncomfortable symptoms. Also, because of the damaged nerves they may not send out the correct pain signals when there really is a legitimate reason for pain, and this makes it easier to have injuries and wounds that do not get noticed right away. Understanding the complexity of nerve pain is not always easy but there are ways to make living with nerve pain easier. Some individuals have specific and at times unusual triggers that make them overly sensitive to various stimuli that ends up causing them pain. For example, some people who have nerve pain have flare ups where the sensation of fabric, such as clothing or bedding, causes pain. Other flare ups can cause the sensation of skin on skin to be painful, making holding hands, hugs, and even kisses painful. An at times nerve pain triggers can make certain body positions painful so one individual may find sitting the best position for reliving pain while someone else is only pain free when laying down and other individual may find they have to change positions frequently to avoid pain. This is a big part of what makes nerve pain such a challenge- there is so much complexity of nerve pain that has to be understood in order to make living with nerve pain easier and more bearable. Not all nerve damage results in pain and other symptoms are commonly noted in patients with damaged nerves. Loss of feeling or numbness is reported in a large percentage of cases and while it is not as painful as some of the symptoms, the numbness can be very annoying and often greatly reduces dexterity which can impact basic things like waking and dressing and driving. Any activity that uses the hands or the feet becomes challenging and severe numbness is sometimes described as being painful in its own way when it is dealt with for years at a time. Some nerve pain flares us with certain activities and other types of pain are related to the time of day and environmental factors. Some nerve pain flares up at night due to the cycle of the day or because of the positions people are most comfortable in to sleep are now the ones that set off the nerve endings and result in pain. This of course makes sleeping difficult and severe sleep deprivation brings with it a host of other serious health issues that are only compounded by the pain. For many people, it is this lack of sleep and the side effects of it that got them to first go to the doctor to try and get relief from their pain. It is here they began to understand the complexity of nerve pain and with the help of their doctor began working on a treatment plan to make it easier on them while they are living with nerve pain. The numbness, tingling, and shooting pain can be dangerous for those suffering from this condition because it affects balance and muscle strength. It makes it difficult to do things like walk or carry items safely. Many people suffering with chronic or severe nerve pain and numbness or weakness will use canes and other devices to help them walk. It can also cause individuals to lose their grip on items when the numbness and weakness is in the hands or arms, and this can lead them dropping things which can lead to injuries as well. It is also important to check extremities often for signs on injury as the numbness and tingling feeling can make it difficult to detect injuries right away and many who suffer from chronic nerve pain tend to push out pain signals as much as possible so they may overlook or try to ignore actual legitimate pain signals from a true injury. Nerve pain often is progressive, meaning that it gets worse as time goes on and usually will not just get better and go away. This is especially true when other health conditions, such as diabetes, are also present. 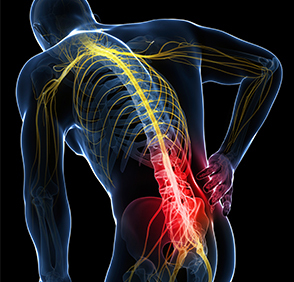 Although some people develop nerve pain for no known reason, many individual end up experiencing it after a major injury such as in a car accident after major surgery, with the onset of another condition such as fibromyalgia, or a major illness such as cancer. Treating such conditions is very important because the accompanying injuries and illnesses are bad enough on their own and when accompanied by nerve damage it is important to reduce pain and alleviate symptoms as much as possible in order to preserve quality of life for the individual. Most individuals dealing with nerve pain try to use over the counter medications. Some OTC meds are used in the form of creams, gels, ointments, oils, or sprays and offer short term relief and are used by many people as part of the pain treatment regimen. Usually, OTC medications alone are not enough and a strong prescription drug is needed to get as much relief as possible. Your doctor can recommend the best one and can help you dial in dosage to get maximum relief while decrease the risks for side effects and the risk for addiction. Some people with nerve pain find relief form adjusting their life style, tweaking their diet, adding certain supplements and avoiding toxins such as tobacco and alcohol. In order to treat something like the complexity of nerve pain it is important to work with your health care provider to find the best combination and approach for your unique situation. They can help guide you on the best path for living with nerve pain, both in the short term and the long term. Many health care professionals and pain treatment experts do recommend one step always be taken- embrace self-care and try to lie life to the fullest. Find what works for you, what activities you can and cannot do, and find ways to enjoy your life while addressing your nerve damage and pain.